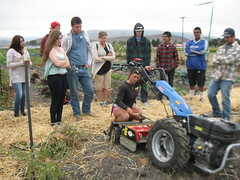 City Farm partners with Pacific Beach High School to offer hands-on, on-site instruction in gardening and farming along with classroom discussion and assignments. Each year, 65 students at the school earn academic credit for this class and through it, learn to prepare soil, plant, cultivate and harvest a variety of crops, and cook what they grow. City Farm in partnership with SLCUSD, initiated a Special Education pilot project in Therapeutic Horticulture. PREPARE (Pre-vocation Recreation Education Productive Adult Readiness Experience) offers training in “independence in survival, independent living, community awareness, self-help and employment skills” to disabled students ages 18-22. 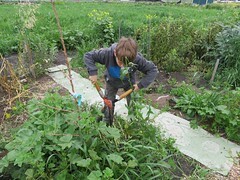 At the farm, students learn to plant, harvest, and take part in creative writing, drawing and photography activities. 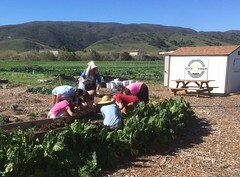 City Farm SLO also hosts Our Global Family Farm, where elementary school children and their families can learn about worldwide food cultures and food cultivation methods.